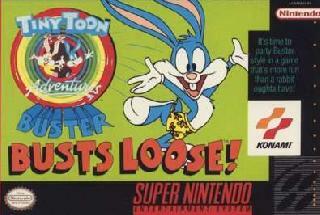 OverviewTake the role of Buster Bunny from the animated series "Tiny Toons" in this crazy SNES action-platformer. Tiny Toons is a game that does not present a fixed story. At different times it features different sports, places, environments and each stage has a history different from other video games. Now you can add videos, screenshots, or other images (cover scans, disc scans, etc.) for Tiny Toon Adventures - Buster Busts Loose! (Europe) [Bug Fix by KingMike v1.0] (Train Bug Fix) to Emuparadise. Do it now! If you haven't noticed yet, we have a retro game of the day feature (top-right of the screen) wherein we feature a new retro title every single day! Now, you can vote for your favorite games and allow them to have their moment of glory. Click on the button below to nominate Tiny Toon Adventures - Buster Busts Loose! (Europe) [Bug Fix by KingMike v1.0] (Train Bug Fix) for Retro Game of the Day.